I could talk to you about what happens in marriage. The romance, the companionship, the tax status. But that’s not why you get married. There’s a deeper reason why. Or I could talk to you about what happens when you exercise. How your metabolism changes, your strength, your life-expectancy. But that’s not why you start exercising. There’s a deeper reason why. There’s a why behind the what. I tell you that because I think today’s message will feel a little different. I feel like my job today is to set up and frame the baptisms you’re about to see so we can all appreciate it. In order to do that, I think I need to talk about both the what and the why of baptism. Because no one is being baptized today because of what happens in baptism. Baptism is actually an ordinary word. It’s a Greek word that just means to wash. That’s it. We can look at ancient writings inside and outside the Bible and they talk about baptizing dishes, baptizing your hands, baptizing your food. It’s an ordinary word. And the water is ordinary water. It’s not water from the Jordan river. Or triple filtered water. It’s just water from a faucet. In fact, we see accounts of people being baptized in the ditch on the side of the road. It’s an ordinary word. Ordinary water. The Early Church talked about how baptism washed our sins. Hence the word, wash. Somehow, in unseen ways, your sins that would contaminate a perfect heaven need to be washed in the righteousness of Jesus. Jesus also talked about how baptism is being born again in the kingdom of God. That orphans dead and outside his kingdom may live inside his kingdom as his children. 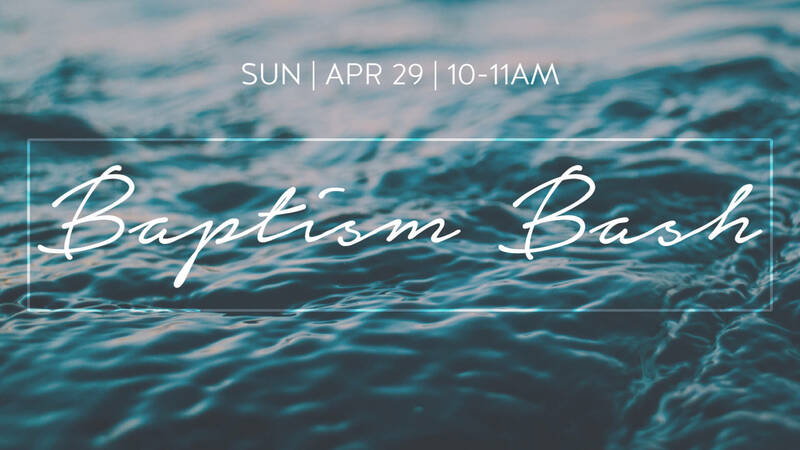 Baptism is also described as a burial of your sins in the tomb with Jesus so that, just as he was raised from the dead, you too emerge from these waters breathing in his new life. The implication being that you were never meant to live. So what I’d like to do this morning is to go back and look at the very first baptisms of the early church, so you can see the single reason why anyone is baptized. The why behind the what. And we can see if what is true for them is true for you. This account of the very first baptism comes to us from a section of the Bible called Acts. And the same man who wrote the biography of Jesus called Luke continues by describing the earliest days of the early church. Now, right after Easter, the city of Jerusalem was turned upside down. Because hundreds and hundreds of people began saying they saw the risen Jesus. And like we talked about here at All Nations, it became so common that bystanders in the city had to stop dismissing the idea that a man rose from the dead and to start dealing with it. And as they considered reasons why a body was missing, the most logical explanations started to defy logic. And suddenly the idea of the resurrection emerged as a viable and the most straightforward explanation. But these sightings of Jesus happen for 40 days when suddenly it stops because his closest followers say he ascended into heaven with two instructions. First, make disciples of all nations by baptizing them. And second, wait for in Jerusalem for the Holy Spirit. And for a few days, this Jesus movement has a scalability problem. Because these blue collar workers who are entrusted with an international movement can’t speak more than a couple languages. You’ve likely heard this story, but ten days later is a festival in Jerusalem and the city is filled with pilgrims from all over the world. And while the followers of Jesus are gathered in Jerusalem, likely in the temple courts, Jerusalem is hit with another supernatural and inexplicable event. There’s a sound like wind, and something like fire, and suddenly these uneducated followers of Jesus start speaking about Jesus… in dozens of languages. Suddenly all of these Jewish pilgrims from all over the world are bewildered–how did these guys learn my language and who is this Jesus they’re talking about. I get it, it’s a scene that suspends belief, but so is the rise of Christianity. Essentially the points of Peter’s sermon are a) You killed Jesus but b) God raised him from the dead. It’s incredibly direct and authoritative. And we see again like we saw at Easter, Christianity doesn’t begin as an idea. It’s not a writing. It’s an event. It’s impossible to ignore. The thousands of testimonies about his miracles. The hundreds of testimonies about his resurrection. The wind, the fire, the undeniable miracle of languages. The crowd can’t escape it. They are cut to the heart and ask, what do we do? They were baptized because Jesus. Rose. From. The. Dead. That’s it. I don’t care what kind of benefits you attach to this water. If Jesus is not raised from the dead, no one that day is even thinking about baptism. There’s no fire and wind. But if he rose from the dead? You kinda’ do what he tells you to. If someone can predict and pull off their own death and resurrection, I’m with that guy. Whatever he says goes. I know you have questions about this book. I know you’ve been hurt by the church, I’m sorry. I know you have questions about this water. But there is only one question that for you–-did he rise from the dead? Because if he did. Then there is no reason to wait. You planned on leaving her dry but God had other plans. Today is the day of your baptism. 3,000 were added to their number that day. I would love for you to be added to this day. That’s a lot to process. Let’s go ahead and give your soul a minute to catch up.